Home > Marketing > How do I set individual page titles for each item? Q.How do I set individual page titles for each item? To set page titles on item information pages, navigate in the Shop Manager to Marketing → SEO (Individual). Near the bottom of this page, you'll find a field for Individual item pages. Click (Edit metatags) here. On the next page, you can select whether to set the same style of page title for all items, or to set them by category or individually. 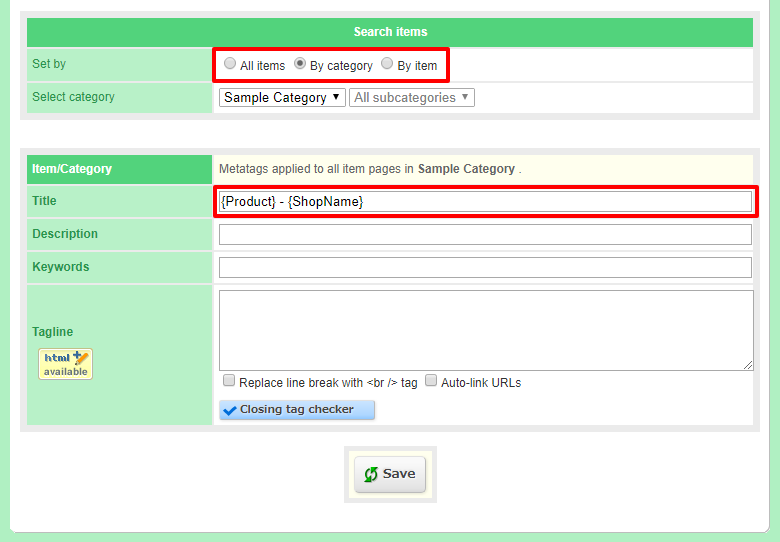 Embedded tags can be used here to insert relevant information, such as item names, into the titles for each page. The list of embedded tags can be viewed here. Click (Save). Page titles will be visible in such places as the browser tab name.